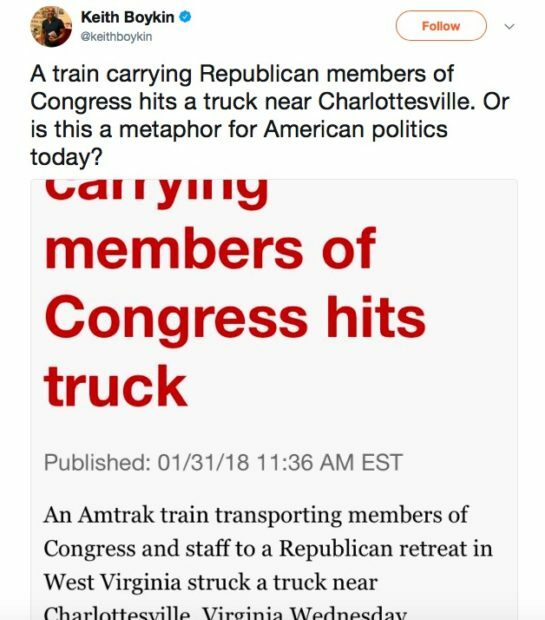 Liberal pundits are making jokes about the fact that a train filled with Republican congressmen collided into a trash truck, despite the fact that one person died during the incident. The train crash occurred Wednesday morning in Virginia, and it was initially unknown if any of the congressmen were injured in the accident. The train reportedly slammed into a trash truck that made its way onto the tracks. One person in the truck was reported dead while two were reported injured–there were no serious injuries to any of the train passengers, which included young children. 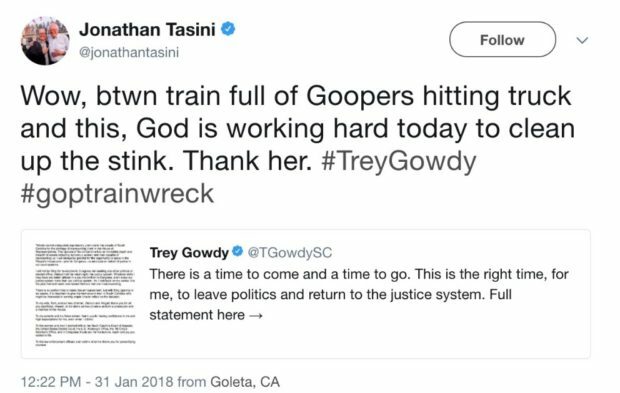 Before it was clear that no one on the train was injured, Sam Stein, a Daily Beast writer and frequent MSNBC guest, joked that the crash is a “metaphor” for the Republican Party. Stein quickly deleted the tweet, apparently realizing he was about to face some major backlash. He explained on Twitter that he deleted it because he realized it was “insensitive” but claimed he only tweeted it upon news that no one on the train was injured. I erased it a while ago because I thought more about it and thought it was insensitive. Palmer Report used the opportunity to call the GOP “trash,” suggesting that the train was the vehicle carrying garbage as opposed to the truck the train hit. Even neo-conservative Bill Kristol got in on the action, insisting that because no one actually on the train was injured its okay to make jokes about the accident.